1km long linear installation suspended above the pedestrian axis of Sainte-Catherine Street East in Montreal. For the 2017 edition of Aires Libres, Pink Balls [an earlier installation by Cormier] has been transformed to become a pastel promenade inspired by the rainbow flag of the LGBTQI community. A succession of six principal colours, each in three distinct hues, combine to form an experience of 18 shades across 180,000 recycled plastic balls. Two sizes of balls are attached on tensor wires and suspended above the street and through the trees. The rhythm and tangle of nuance combine to become an unbroken 1 km long chromatic ribbon, vibrant both day and night, above the summer pedestrian axis of Sainte-Catherine Street East, in the Gay Village of Montreal between St-Hubert Street (Metro Station Berri) and Cartier Street (Metro Station Papineau). 18 Shades of Gay celebrates the evolving spectrum of LGBTQI community identities – plural, diverse, inclusive and nuanced. 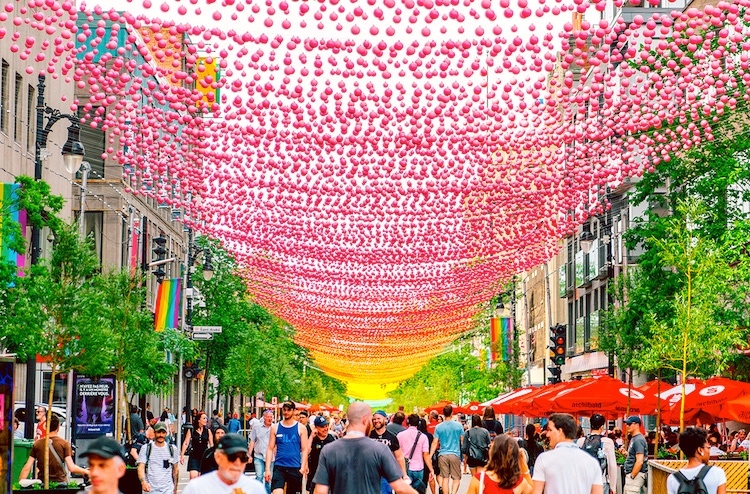 In the context of the 35th anniversary of the Village, the 10th edition of Aires Libres, the 1st edition of Pride Canada in Montréal, and the 375th anniversary of the City of Montreal, this transformation had the imperative to be all the more flamboyant! It has a magical fairyland quality that’s quite pleasing, and there are sure to be calls to continue the temporary installation when its scheduled time comes to an end. Claude Cormier (born June 22, 1960) is a landscape architect from Quebec. The majority of his projects are located in Montreal and Toronto. … Within the conceptualist movement, the practice of Cormier and his team is distinguished by an insistence on investigating the historic, economic, botanic, ecologic and socio-cultural strata – both hidden and visible – that make up the places on which they work. Each project weaves itself into a complex network of meaning, yet remains clear in its design intent. This “weaving” results from the conjugation, or crossing, of diverse conceptual, material, and historic elements. As a result, each project possesses a certain singularity that arises from its semantic density. … Cormier’s philosophy can be concisely summarized into the following phrase: “Artificial, not fake”. What he strives for, above all, is a form of authenticity – a “true-false” – in other words, to show the constructed nature of landscape in a straightforward and honest way. A finished project must present itself as a hymn to life; to achieve this, Cormier uses an exuberant color palette, and innovates by incorporating artificial materials in surprising ways that defy their intended contextual use. There is a spirited humour, sometimes even sharp, that emerges in many of the projects and which has actually become a sort of trademark for the firm. 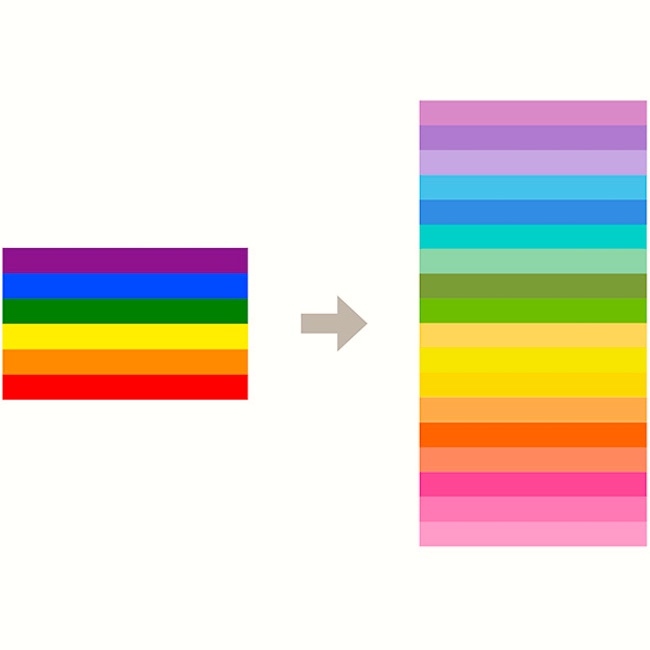 This entry was posted on August 9, 2018 at 9:40 am and is filed under Art, Color, Gender and sexuality, Homosexuality, Rainbow. You can follow any responses to this entry through the RSS 2.0 feed. You can leave a response, or trackback from your own site.